The year 2015 marked the 50th anniversary of Valparaiso University Law School’s student-led Law Review. Here was an opportunity to stand on history and tradition while showing the world that VU is a world-class, 21st century law school. 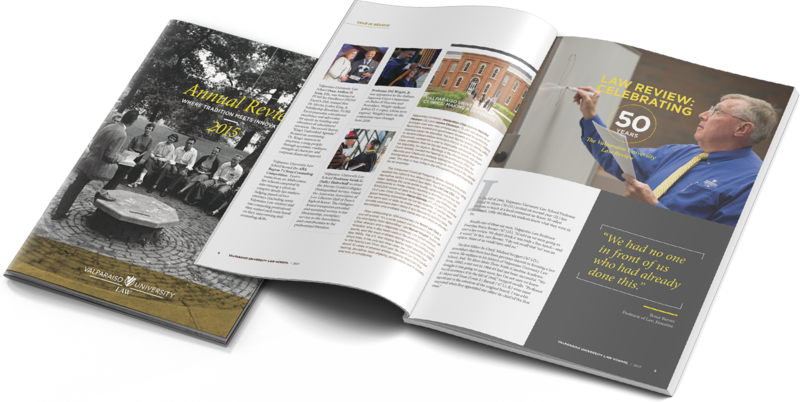 We combined historical and contemporary photographs to draw the parallel between the Law Review’s original editorial board members and the great legal minds of tomorrow. We leveraged the school’s existing color palette to present a serious, yet energetic look. "We had no one in front of us who had already done this." Telling a great story requires first asking great questions. Hours of focused interviews unearthed everything from angst to ambition…and the story of the first Editor-in-Chief scrounging dinner for a custodian when the two were trapped at the Law School during the blizzard of 1967.